© 2009 Barbara Rolek licensed to About.com, Inc. 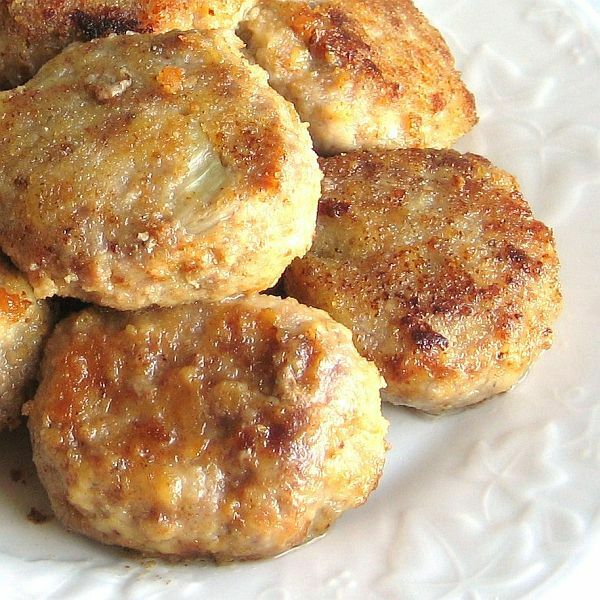 This recipe for Russian mini hamburgers or kotletki is a popular fast-food dish that is eaten for lunch and dinner. In Poland, these are called kotleciki (kawt-let-SEE-kee), which are miniature versions of kotlety. They can be made with any combination of ground meat, but beef and pork are most popular. ﻿Grated potato or bread softened in milk can be used as a binder. If using the former, grate 1 medium peeled potato with the onion and skip the bread and milk. In a small bowl, soak bread in milk until soft and all the milk has been absorbed. Transfer to a large bowl and add grated onion, meats, salt and pepper. Mix thoroughly. Using a small cookie scoop, portion meat into golf-ball-size pieces and flatten slightly. Coat the kotletki in breadcrumbs and let dry for about 10 minutes. Heat oil to a depth of 1/4 inch in a large skillet and brown kotletki on medium heat in batches, about 2 to 3 minutes per side, adding more oil, if necessary, and remove to a plate. ﻿When all kotletki have been browned, return them to the pan, adding more oil if necessary, cover and cook on low for 10 minutes, until completely done. Transfer to a serving plate and garnish with pickles and sour cream, if desired. Serve with buckwheat groats on the side.